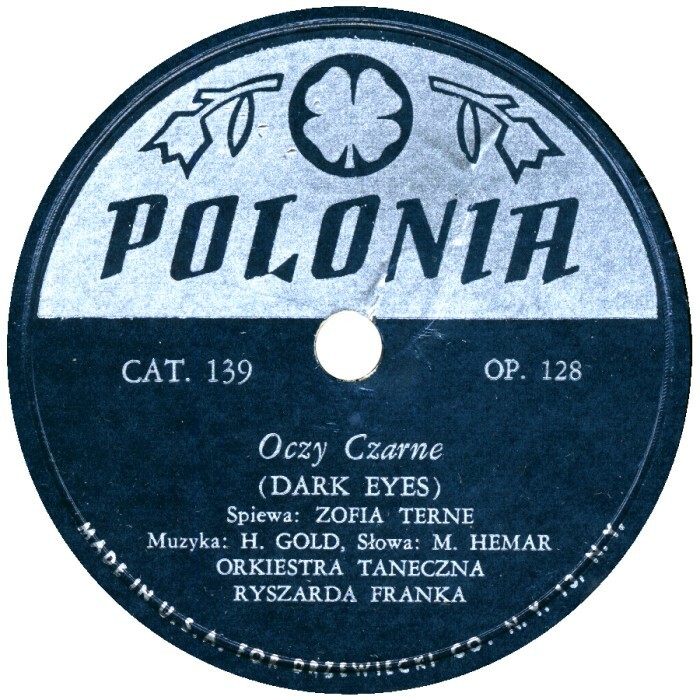 "Polonia" (also referred to as "Orbis-Polonia") - recording label of Polish emigre company Orbis (founded in London in 1944, specializing mostly on publishing and selling Polish books). 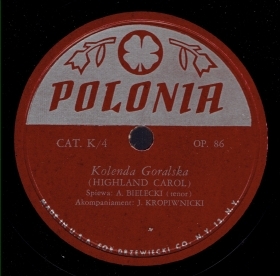 Most of Polonia records are 78 rpms: initially made using masters from "Melodia Record" (USA) (a green-and-golden series, with catalogue numbers from M-1 to at least M-10), later own recordings of emigre Polish artists (the main green-and-golden series, catalogue numbers from 101 up to at least 234; the red-and-golden series of Polish Christmas carols etc., catalogue numbers from K/1 up to at least K/12). 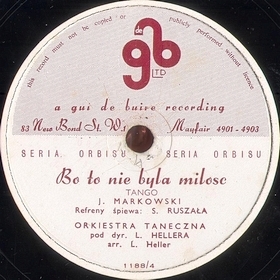 The same label was used also for few ELs and LPs. 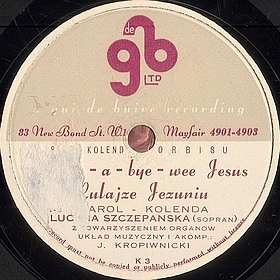 - American release (pressed on RCA Victor facilities for Drzewiecki Co.). 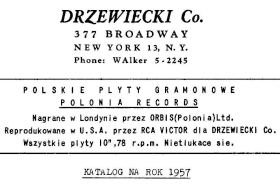 Labels do not mention Orbis and do not contain copyright info; instead, there is an inscription below the main text: "Made in U. S. A. for Drzewiecki Co. N. Y. 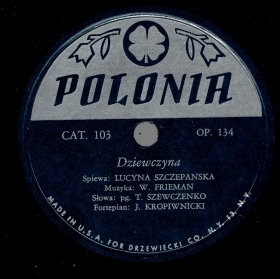 13, N. Y." 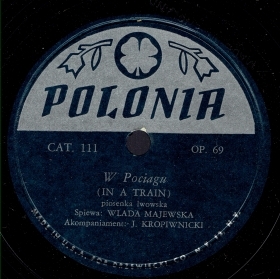 Label's gold color is replaced by silver one, and the main theme color (green or red) has a different variation. There is an additional embossed inscription "MADE IN ENGLAND" on the mirror. 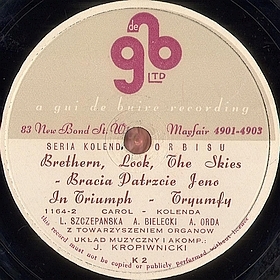 Today, most of available "Orbis-Polonia" records belong to this release. 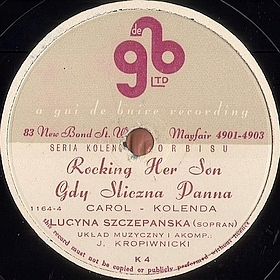 - Australian release. 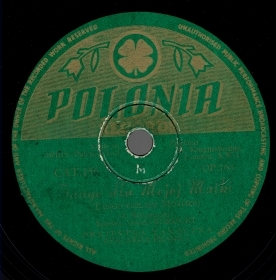 Some records show participation of E. M. I. 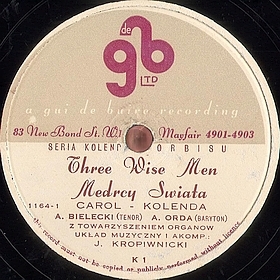 Sales & Services Ltd. (this name and Emidisc logo were found embossed under the label). 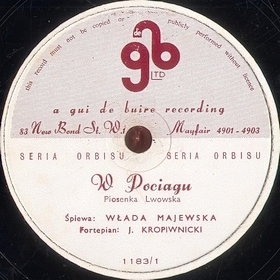 Labels contain "recorded in England" instead of "made in England". 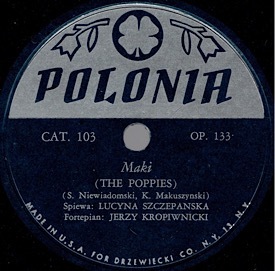 Original indices (catalog CAT.nnn and matrix OP.nnn) are accompanied by new ones: catalog/order PR.nnn and matrix FS.nnn (both types of indexes may coexist or OP.nnn may absent). Design of labels is changed: logo is a bit smaller, the lower part of the label is encircled by a line of the same color which is used for background of upper part. Some records have a "negative" label: instead of gold text and images on green (red) background, there are green (red) text and images on white background. The mirror also contains new FS-nnn index, whereas the old one OP-nnn may be missing. 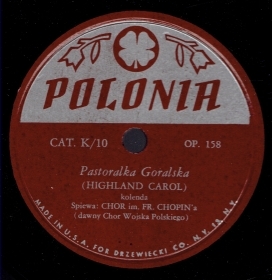 Some "Orbis-Polonia" records were also re-issued by other companies under their own labels (such as PO-nnn series of Carinia records, Australia, with red and white labels).